This spinach salad is the perfect lunch or side dish in the spring or summer. It is easy to make and sure to be a crowd pleaser. With only 5 Smart Points, there will be now guilt! 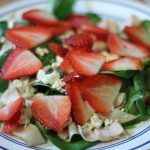 This a great salad when strawberries are in season. This will make five salads. Just equally divide all ingredients between the five salads.